J Murphy and Sons is a multi-disciplined civil engineering and building contractor. The main sectors include rail, natural resources, power and water. Richard Burnham, Compliance Manager explains how Murphy’s has continued to implement FORS standard and procedures in order to reduce emissions (CO2, NOx & PM) across its operations in the UK, whilst also managing fuel cost for our vehicles; improve our road safety record; and manage transport related fines and charges. 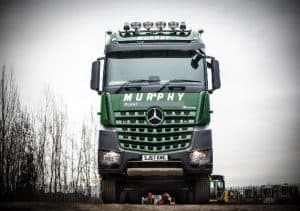 Murphy’s was approached by the FORS team in 2013 and immediately jumped at the opportunity to join the scheme to improve lorry and driver standards. This was initially at its London depot in Kentish Town. Having obtained and held the FORS accreditation for four years at this location, 2017 started the roll out of FORS to our other Depots around the country, with Golborne Depot achieving FORS Bronze in February 2018 and Silver in October 2018. We have continued to adapt our fleet to the continuing requirements of our work, purchasing further Euro 6 vehicles built to our specifications, which include FORS safety features that protect vulnerable road users. The vehicle seen in the picture above is an example of one of these such vehicles. Murphy’s at Golborne passed the Bronze and Silver assessments using the experiences gained from our other depots, this has resulted in a process where we are continuously reviewing and improving our practices. The FORS assessment process has been very influential for us to keep working towards the accreditation and maintaining our programme of training for drivers and managers using the FORS training materials. 2017, saw the company extend its FORS accreditation, under the guidance of the Compliance Manager, across three other depots within the company – Cannock, West Midlands; Ollerton, Nottinghamshire; and Golborne, Cheshire. 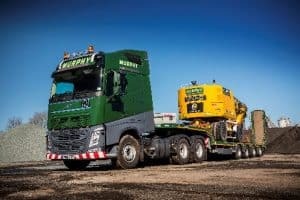 Murphy’s as a company realised what benefits there were in being FORS accredited. From the first Bronze accreditation in 2013 at Kentish Town, to achieving FORS Bronze and Silver across its four main operations, this has helped us focus on best practice and the implementation of robust procedures. Following on from this success, and the achievements realized, it was a natural progression for the Golborne Depot to achieve Silver status and onto Gold. This has given the company a positive recognition with our customers, for whom FORS accreditation is a minimum requirement when tendering for works throughout the country, and not just for London. Demonstrating compliance with CLOCS and being FORS accredited has never been more critical for the sustainability of our business. We use the FORS tools to the full, with all drivers undergoing regular training and toolbox talks, and managers working towards FORS Practitioner. The training provided has seen improved driver reporting of damage to our vehicles. FORS continues to provide us with tools that enable us to continuously progress our Transport Management System and focus on performance monitoring and best practice. The Company see the plan to extend and maintain its FORS accreditation as a key element of its business strategy, as Local Authorities and major clients from across all industries continue to drive safety improvements through their construction projects and the associated supply chains. One of our aims is, in partnership with FORS, too show our continued commitment to achieving the high standards demanded from a professional transport company operating throughout the UK by having a well maintained fleet of modern vehicles fitted with the most up to date technology, which is driven by highly trained professional drivers. Performance data – 2018 saw the average MPG of our fleet increase when compared to 2017, however the number of incidents reported has increased due to improved reporting process and driver awareness for the need to report all incidents, whilst the number of PCN’s issued increase due to more deliveries being made to sites located in urban areas. Driver health and fitness review – At Murphy’s, all drivers undergo a comprehensive fitness and health review before they are allowed to operate a HGV vehicle for the first time and then every two years each driver has a medical health check. Strategy for recruiting drivers – We have 3 recruitment methods, our web site, the use of careers fairs and the use construction industry engagement initiatives; all of which are designed to encourage new drivers and apprentice fitters into the industry. Noise assessment – The construction sites we make deliveries too are operated by J Murphy and Sons. Many sites will have a formal Noise and Vibration Management Plan in place. These sites will also have a local traffic management arrangements for access routes to and from the site, which will avoid local schools, retail and residential areas. Modal shift and alternative vehicles – Murphy’s are a multi-disciplined civil engineering and building contractors, and generally it is not possible to modal shift. However we are actively looking at alternative fuelled vehicles with our suppliers and manufacturers. Maintaining FORS Accreditation, and including the addition of this depot shows how dedicated we are as a company to improving road safety and the safety of all vulnerable road users nationally, as well as in London, along with the fact the FORS Standard has given recognition to the transport operation within the company. We will continuously use what FORS has taught us to help manage our environmental impact and make the roads safer for everyone that uses them. As a result of FORS we have a better understanding of the incidents that occur with our vehicles, and have been able to customise driver training to address the root causes, which has resulted in our insurance company maintaining our premium levels and supporting our driver training programme.